Changing times. | Come Here To Me! I took this photograph on my way home from work today. On the left, are banners for the upcoming Dublin Pride event, an annual march by the LGBTQ community. On the right, flags can be seen flying for the Eucharistic Congress. It’s a remarkable sign of the times, and made me think just how much Ireland has changed since the Eucharistic Congress was hosted here in 1932. The times are not without their significance for Ireland. In this year of Congress, the eyes of the world are upon her- a Catholic nation with a Catholic government and the social encyclicals of Leo and Pius open books before them. I suppose, the times are not without their significance for Ireland once more. Just like in 1932, the streets are decorated with flags and bunting. Unfortunately for the organisers of the event though, it seems football is our religion now. Ole Ole Ole. If I may pick only have of your focus, I wonder if it helps young lgb people in Dublin that from early April to August there are banners for g, lg or lgbt events on the quays. First up in April are the banners for the Dublin International Gay Theatre Festival, which is held on the May bank holiday weekend. They are replaced by the banners for Dublin LGBT Pride, which is held the in the week leading up to the last Saturday in June. And they in turn are replaced with the banners for GAZE, the Dublin Lesbian and Gay Film Festival, held on the August bank holiday weekend. They expected 20,000 at the RDS and got 10,000. At least the trend is going the right way. There’s two sets of Eucharistic bunting and one papal flag on my road. Quite nefarious using the football as cover, but Id expect nothing less. Love the Pope’s Army. About right. There is a protest on Sunday when the Eucharistic congress hits Croke Park if anyone is interested. If you can go try to bring as many children’s shoes as you can rustle up from your local charity shop or elsewhere. 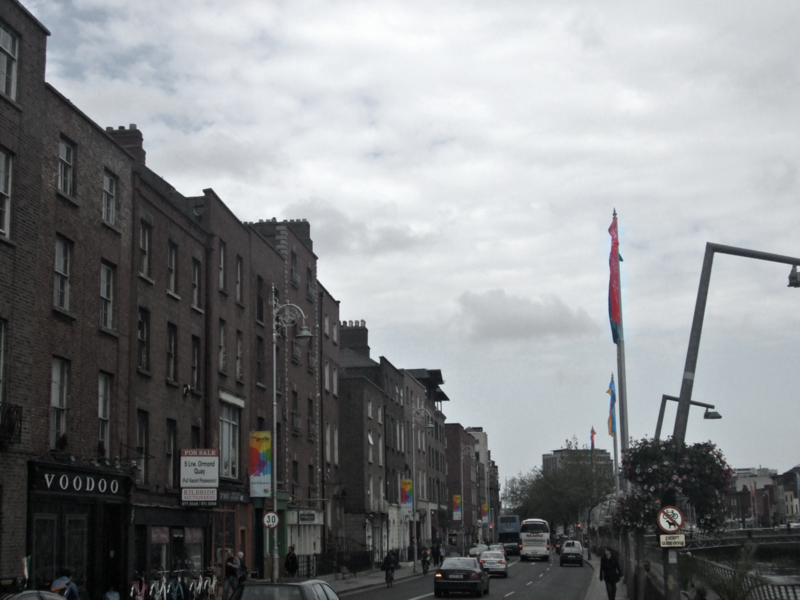 Saw the Euc Con flags being replaced on Wood Quay this evening, by Pride flags, appropriateley enough.